« The End of the Beginning…! The other morning Meredith noticed something out of the ordinary had been at the little dry food pellets (kibble) in a cat bowl. Was it a mouse? A rogue cat from over the way? Or was it a “doesn’t-bear-thinking-about”? Time to take up the cat food bowls overnight and be on the lookout for unwelcome visitors. The following morning, I’m sitting in my chair after breakfast checking through the email when something catches my eye…. I look up and focus on the cat bowl at the entrance to the larder. Something is there, and it isn’t a cat. The feline population are all outside sunning themselves, having eaten their fill for the moment. It is facing me–snout first, full on–difficult to see clearly. First thought–a RAT! Worst fears, lift legs, shout for Meredith…? THEN, I pull focus more finely and see the plump, little body of the beast and the tell-tale spines sillouetted against the light streaming through the open back door. RELIEF! Legs down, call softly to Meredith…. Meredith peers round the entrance and sees the “uninvited visitor” and laughs. “There you are!” she says quietly to the youngster with the adventurous heart. The frame freezes as we all take in the situation. The baby hedgehog is the first to move. It skittles back into the larder which has clearly been its home for a day or two. “You’ll have to wear gloves”, I say irrelevantly, as Meredith disappears towards the tool shed. Spot anyone hiding out in the larder? Pippa, head cat, is unimpressed. Later that same day as Meredith sat in front of the computer, who does she spy but young Master Intrepid making his way from the front door this time into the kitchen, heading toward the cat bowls by the back door. Needs must when the stomach wills? Or innocent insouciance, carefree and fearless? on May 2, 2015 at 11:52 am | Reply Liz P.
These creatures are so cute – to my knowledge, we don’t have in the States. those pictures of Meredith and the baby hedgehog are priceless! Well done, green gloved goddess. Adorable, all the makings of a good children’s book about Master Intrepid and the cats!! Are you sure the little hedgehog is healthy? As far as I know, hedgehogs only come out when it’s dark outside. When we see them out in daylight (here in The Netherlands) there is something wrong with them. Looked healthy for sure. We don’t know when he came indoors–probably the night before. How wonderful😊!! They are on the decline over here in England. What a little treasure! So cute !!! We had one of these little darlings live under our garden shed My son who was 3 at the time named him Hodge …….. mainly because he couldn’t say hedgehog. 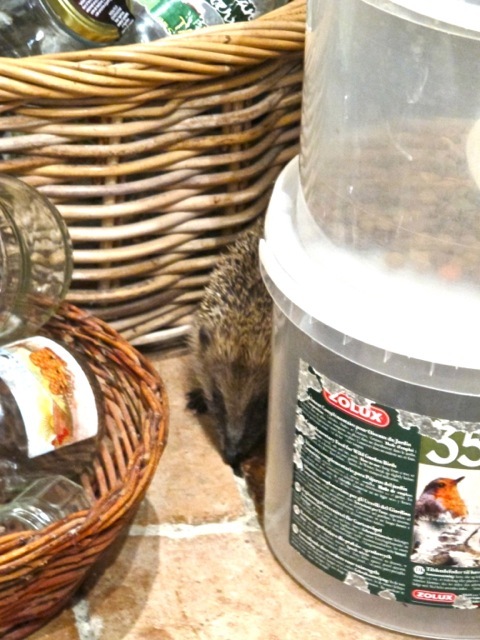 We fed Hodge with puppy food until the winter when I presume he hibernated………….didn’t investigate his disappearance too closely. I wanted to avoid a difficult conversation with an inquisitive 3yr old. 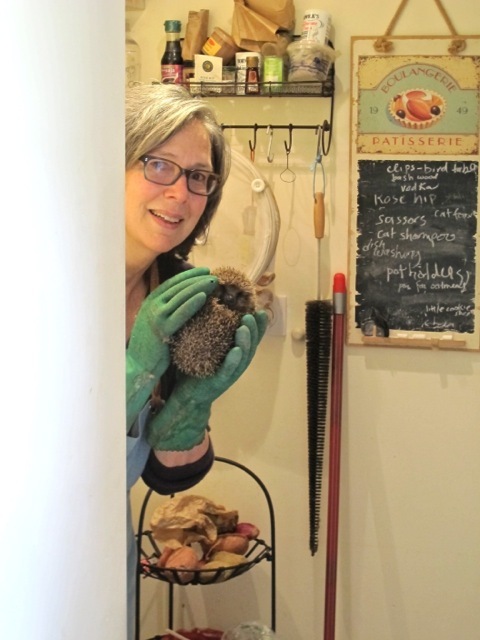 Hi, I’m Anne Hodge but no relation to Ros’s hedgehog. We live in the Vendee where there seem to be a good number of these wonderful little slug eaters. I just wish we could encourage a few more. Our cats ignore them, as does Archie our 14 year old Border terrier. There doesn’t seem to be an equivalent to Mrs Tiggywinkles in France. What a wonderful story and pictures!!! You’ve made my day! Sweet! Could you not have left it alone? Cat’s wouldn’t bother with it and if they did, perchance, investigate, the little guy would roll up into a protective ball. He was leaving evidence of his visit all over the ground floor! 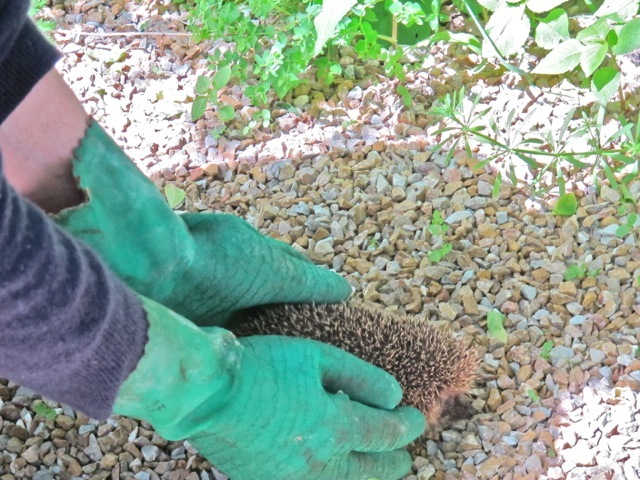 We have a family of hedgehogs living under our compost heap, I love them and I agree, you were lucky with the sitters. It’s not really the hedgehogs, it’s rather the “doesn’t bear thinking a bouts”! “The Green-Gloved Goddess Lends a Hand” would be a lovely title if you ever thought about expanding this incident into a children’s book… just sayin’. Your writing style is so warm, appealing, and evocative, and this is a particularly engaging story. Thanks, Kathy–un de ces jours! I love this! Hedgehogs are so wonderful. I hope he sticks around. I have got a bunch of opossums that eat my cat food when they can, outside! Love this story and the pics, what a brave little fuzzypeg. Is he still visiting for a night time feline snack? Many years ago when I lived in suburban North London, I looked out of the bedroom window one morning to see the badminton net, that had been left on the grass the night before, all rolled up and moving around the garden. It was being followed closely by my Siamese cats, who were tapping the net slightly nervously but were clearly very intrigued. I rushed down to discover, completely entangled within the net, a very stressed little hedgehog. 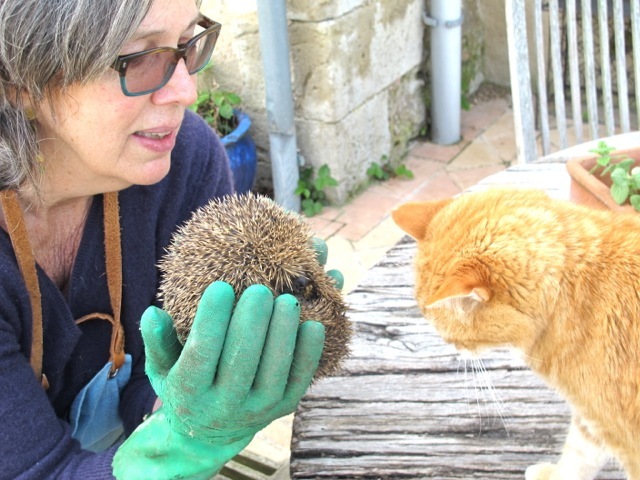 Have you ever tried to disentangle a rolled up hedgehog from netting? Not easy! Eventually I had to don gloves and very carefully cut the net off. He eventually unrolled and scuttled away. He did however return the following evening to join a circle of five cats all eating from a large plate of cat food on the patio. Not one took any notice of him, they just shoved up to make room for their new friend. Wonderful, Sallie. Fear of foreigners clearly less pressing than feeding your tum–in the cat world! Awwww. I hope you all are finding a way to live together in peace. Makes me miss my hamster-mom days. How fortunate you are! I would love a hedgehog in my garden. They are actually quite rare now in UK. We have asked to make holes in our fences so the hedgehogs can travel about, and get from one garden to another. I wonder where baby hedgehog’s mother and father and brothers and sisters are! I wonder how young hedgies are when they leave their mothers?? How gorgeous is that hedgehog. You are such a brilliant story-teller Robin, you should do more writing. We run a nature reserve and Conservation Trust here and we feed our rescue hedgehogs wet dog food (particularly important at the moment because they have just woken from long hibernation so need feeding up before next pregnancy makes more demands on their bodies). Many people feed them bread & milk, neither is good for them. They can’t digest lactose & bread just fills them up with the wrong type of food. It’s protein and fats that they need. 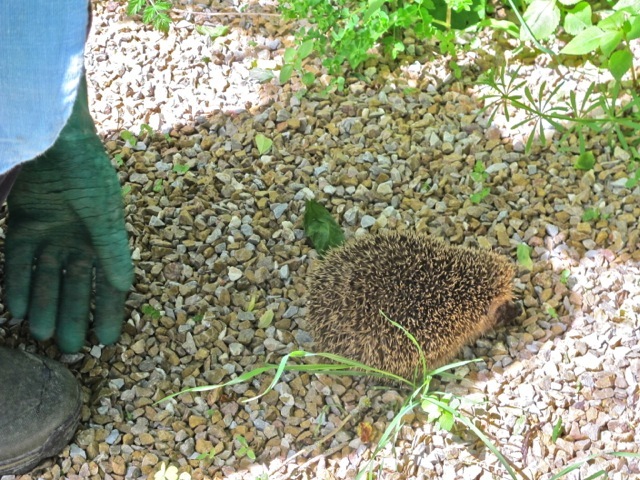 Hedgehogs are increasingly rare now, it is thought due to all the slug pellets and weedkiller people use in their gardens, neither of which is necessary. Vinegar kills weeds better than any weedkiller and a small pond with some shelter (such as a rock crevice or an upturned terracotta pot propped up a bit) will attract frogs and toads who will eat slugs. Wool pellets will keep slugs & snails off precious plants like lettuces. Here we only grow plants which aren’t eaten by them (of which there are thousands of glorious choices). Sorry if this sounds preachy but I do love hedgehogs and also song thrushes who also suffer the same problem from people poisoning slugs and snails. Love the photos; he’s lucky to have found such a kind home. Meredith adding her 2 cents: We run an organic garden and never use slug pellets. Our hedgehogs love the cat food. That said, one seems ill today, tottering around in daylight which isn’t normal. It’s a Sunday so can’t take him to a vet. If you have any ideas, let me know. I do use the vinegar/salt/dishwashing liquid weed killer in the gravel courtyard. Delightful story and photos! Always a pleasure to hear of adventures at the Robin Ellis household. Your hedgehog stories are wonderful. Yes, a children’s book! I don’t mean to be a (hedge)hog and write two comments — but I cannot help but say what a lovely group of people are sending in their comments! I feel blessed to be connected to the kind people all over the world who are so very interesting and care about animals and other good things! 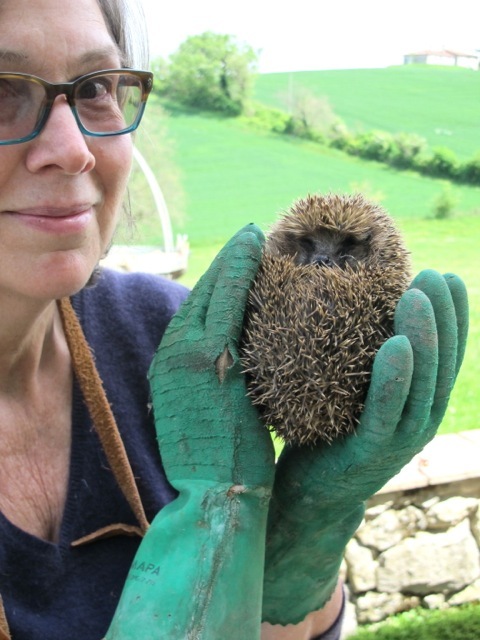 And to think this all came about owing to a baby hedgehog’s appearance in Captain Poldark’s house and Mrs. Poldark’s bravery! maybe call a wildlife rehabilitator in your area and ask them if there is something you can do? sometimes they will help over the phone. I am sorry, I never meant my comments to be thought as aimed at you and Robin. I know you are organic and care greatly for the environment. Many apologies. It is possible that your tottering hedgehog is dehydrated if he has been eating dry kibble? It is better soaked. If that is at all possible, making sure he has easy access to water is obviously a good idea. I wouldn’t try getting water down his throat though as he could easily choke. If he curls up when approached, then that is a very good sign. If he does not, then I would put him somewhere safe from predators (such as foxes and badgers) until he can go to a vet or wildlife centre. A cardboard box with plenty of air holes lined with dry leaves or straw or shredded or crumpled paper and a few slugs or worms and some water he can’t knock over would be ideal. Raw egg is a wonderful food for hedgehogs. Thank you very much for this, Jack–very handy advice. What a lovely posting, hedgehogs seem to be few and far between at the moment so great to hear about the cheeky little fellow. I truly love hedgehogs. I wish I could have one but I fear my cats might look at a hedgehog as a meal. 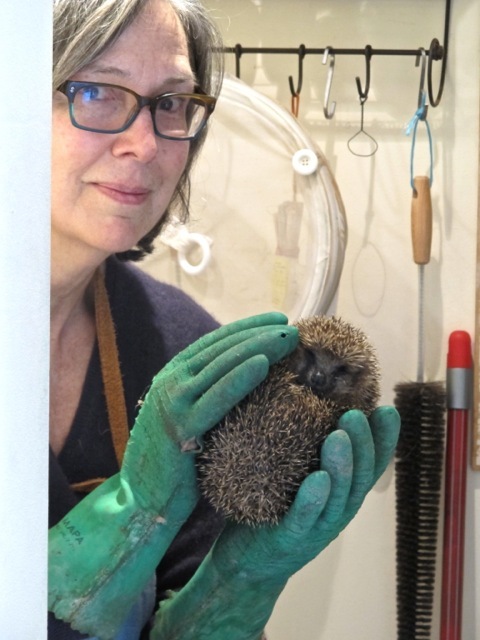 I love the blog regarding the hedgehog and the photos are wonderful! I haven’t seen a hedgehog (well not one squashed on the road anyway) for probably over twenty years here in the UK. It was lovely to see these photos. 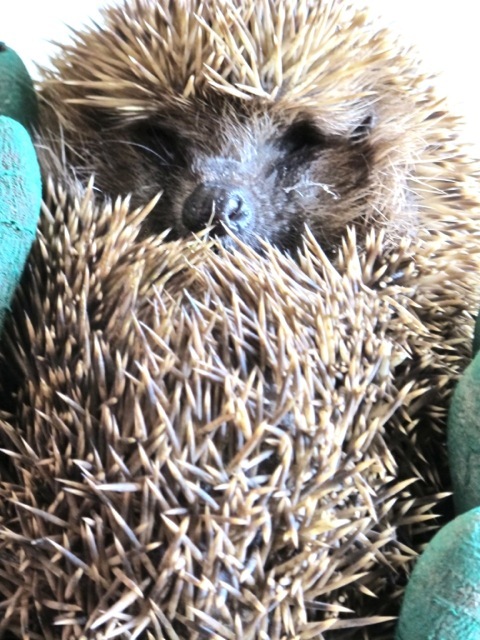 You may want to check the poorly one for maggots particularly the ears, I have had to remove maggots from a couple of hedgehogs that I have looked after. If you catch them quickly you may get them all with tweezers. If they have too many you may need ‘rescue centre’ help with better resources. I would love them in my garden again I know they are getting scarce. How’s the little guy doing? Are you sure that it was not a Siberian Hamster named Basil? Just enjoying a concurrent run of your Poldark and Poldark 2015. Looking forward to meeting Rev. Dr. Halse. Thank-you for all the great stories that you have brought to light. Best regards, Michael Peters. That would be truly news worthy, Michael!